Ahhh Pinterest. Everybody's newest source for recipes, inspiration (and wasted time;) ). Why is it so dang addicting?! Awhile ago, I thought it would be fun to try out some of the more popular Pinterest recipes, the ones that get pinned over and over and over again, and review them. It's only been pinned, oh I don't know.....six million times or so? 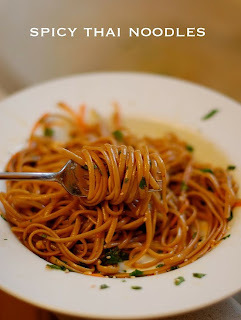 I first saw these noodles last summer when I first joined Pinterest, and even yesterday it showed up on the most popular page with a crazy buttload of pins. We were going to a swim/pizza party as a family, but wouldn't be served our pizza until later in the evening. I had been trying to rack my brain as to what to serve everybody before we left (and almost went with peanut butter and jelly sandwiches), when I realized I had everything on hand to make these noodles. It was about time I try them! Put a large pot of salted water on for spaghetti to boil. Once boiling, cook to package directions. In a small pot over medium heat, add the chili flakes, vegetable oil and sesame oil. Cook chili flakes for 2 minutes to infuse the oil (you could also add a crushed garlic clove at this point to give the oil a garlic flavor). Strain out the pepper flakes, and reserve the oil. Place the oil back into the same small pot, and whisk in the honey and soy sauce. Set aside. Drain the noodles once cooked, and place back in the pot. Toss on the sesame oil mixture and mix well. Add the green onions, carrots, peanuts and cilantro if using. Toss until mixed well. These noodles taste fine while hot or warm, but taste even better once cold, so place them in a serving dish and either serve now or place in the fridge for an hour or so. We freakin' loved these! I kept stealing bites of the noodles from the fridge while I was getting ready for the swim party, and then when it was time to eat, I may have possibly made my kids peanut butter and jelly sandwiches anyway, so there would be more noodles for me. Maybe. I actually made a half batch of these noodles and scaled the chili flakes way back to one teaspoon so my kids could handle it. It made it so the noodles were nicely warm on my tongue, but not enough that my kids complained about them being too spicy (although my 4 year old did go "my tongue is hot!" I just gave her a drink of milk and she kept eating them). If I were to make a full batch I would probably use two teaspoons, again for my kids, but if you like things spicy I would add in one tablespoon or more of chili flakes. I didn't have any cilantro on hand, and to be honest I didn't miss it at all. I loved how easy these were to make and they were made with things I always have on hand; that makes them a very likely candidate to be made over and over again. 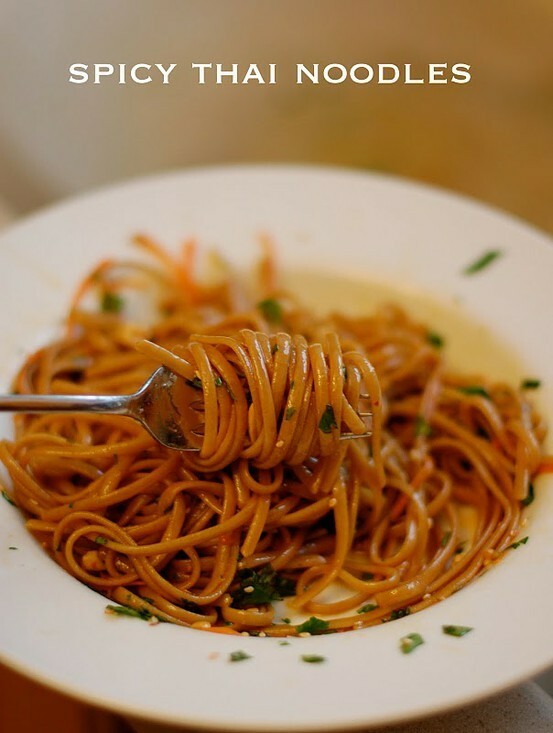 I liked the mouth feel of the noodles, which is a weird thing to say, but I feel like whenever I've tried to make peanut noodles, they always have this cloying, almost gritty texture from the peanut butter. These noodles were smooth, velvetty and yet very nutty tasty from the sesame oil. They were pretty much everything I always want peanut noodles to be. The ONLY thing I would change about this recipe (and it's not even a big deal) is the name. "Thai Noodles" doesn't describe these at all, since these aren't Thai ingredients. I'm going with Sesame Noodles. Call them whatever you want, it doesn't affect the flavor....everything about them is fantastic. Looks delicious! And good on you for noting they are not Thai noodles :-) I'm sure my kids would love this.